It is beyond the reach of any scholar to subject the whole of such a rich text to a complete and comprehensive analysis and study. Realising the impossibility of a task of such magnitude, C.K. Rangan has narrowed down the scope of his research by judiciously choosing the phonological rules as laid down in the 483 sutras of Eluttatikaram, the first section of Tolkappiyam. 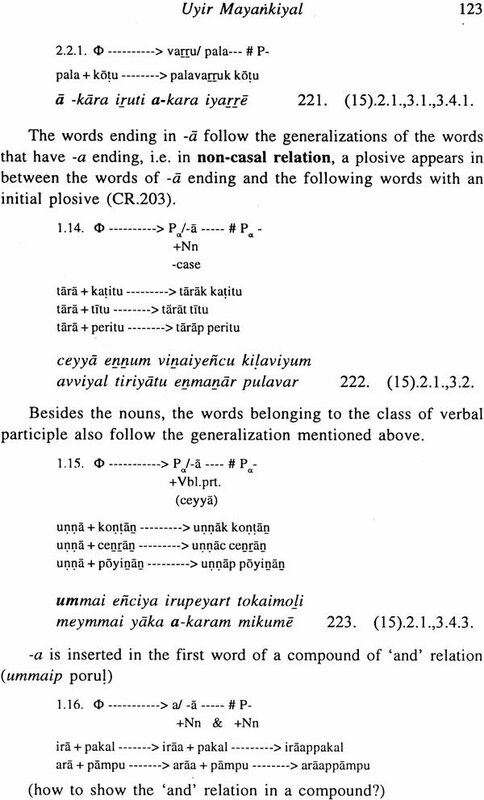 It has now been accepted by students of structuralist linguistics and generative grammar to codify and formalize the phonological components of language. Such a categorization helps in providing conceptual tools for the purpose of analyzing and arriving at significant generalizations of language. C.K. Rangan has met this demanding and, challenging task of completing his project "Toward Formulating Formal Phonological Rules of Tolkappiyam - Eluttatikaram" most successfully. I am confident that his scholarly work will prove a useful stimulant in providing a workable methodology for further research in related areas. I congratulate the Publication Division for bringing out this precious little volume.